This showed up in my e-mail today. I didn't recognize the name and had to google what the suit was about; Apparently XPO Logistics, which does deliveries from IKEA, had a robocall survey calling people a few days after receiving a delivery from IKEA, and there was something illegal about how it was set up. The class included anyone who had received an IKEA delivery, and I believe I only had to provide my phone number as proof of being in the class. These class action things are often around $10-$20, or sometimes silly amounts under a dollar where sending the check cost more than the amount, but sometimes they're serious amounts of money. This is definitely something to get into if you don't already. 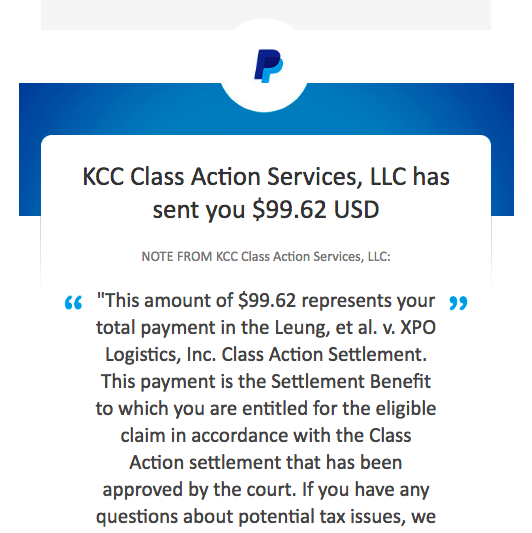 Click the "class action suits" label on my post to find my other posts where I've explained how to find these suits and sign up. It's definitely worth it when payments like this show up.